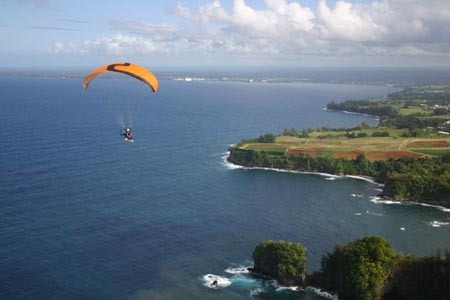 Powered paragliding is growing in popularity on the Big Island as a way to enjoy our beautiful island paradise from above. Due to our gentle slopes, the opportunities for powered launches are much more abundant than without the motor. There is a growing group of pilots who fly regularly in the Pepeekeo area on the East side. Numerous waterfalls and endless green pastures make this area ideal for PPG. The tradewinds may be ripping past the coasts on both the south point and north ends of our island, but Onomea/Pepeekeo typically have very gentle or calm conditions year round. Bill Heaner with WalkerJet out of Salt Lake was here last week training instuctors. Despite somewhat wet conditions, everybody enjoyed some breathtaking flights. People visiting the Big Island can contact me, Eric Weinert 896-2610 and I'll try to hook you up. I've only been at this for a year and a half, but I can direct you to some very experienced pilots. 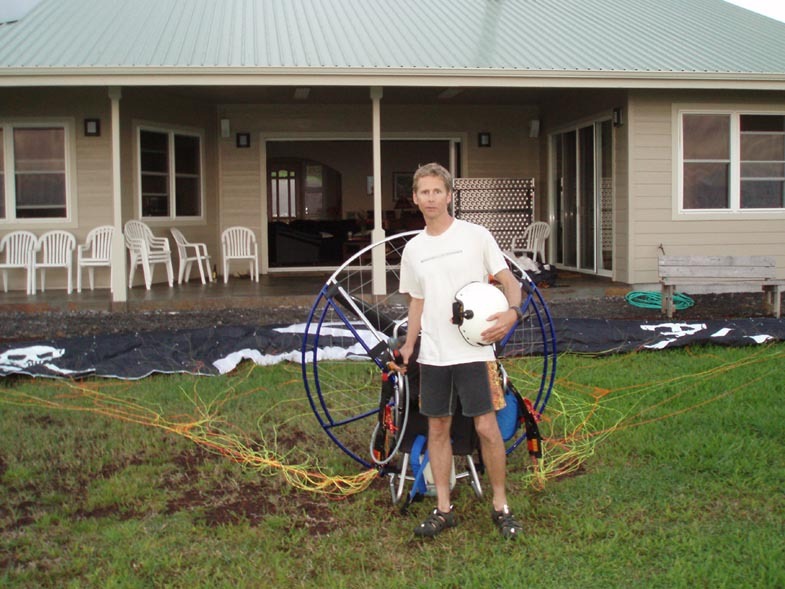 Thanks to Alex and the windlines community for allowing us to post to your site and share our love of paragliding. From time to time I'll post pictures from different areas of our island. Thanks for sharing the article and pictures, Eric. I hope to read more about your adventures over there, and maybe I'll get a chance to come visit sometime. And give me a call if you find yourself on Oahu with some free time and we'll do some flying. If we ever get a break from this rain we've been having! Eric, It sounds like a good way to get some airtime in your neighborhood. Here on Oahu the motor is pretty impractical with our normal strong trades and I am actually happy for that. But I do enjoy all types of flying. It looked like it was flying fine, even with the inverted flip through the lines, I bet he didn't even get hurt. The prop spinning the whole time looked pretty dangerous. Yep, you'd think he would have turned the blender off just after the twist, or at least the chute deployment! Although, he had it, keeping the power on caused him to twist up when the lines unloaded. I think if he would have throttled back the engine near the top of the arch, gravity and momentum would have taken care of the rest. Well, now we know how to pull it off, or at least what to do if we don't. I'd love to see fireman with the motor and the funky! Happy to have stimulated some comments. If you guys are ever over, be sure to call us and try it out. Saturday I was up with John Linhart above Kawaihae Harbor on the dry side, catching thermals, just turned the motor off and soared about. If conditions were just right Island hopping may be possible, our goal here is to set up enough LZs and refueling places to circle the Big Island in a day. PS. Never seen a loopty-loop executed with a motor before. Eric, Dave and Mark are two of our best and most ambitious pilots, so if there's a record to be broken or a stunt to be executed you can bet they'll be involved. I don't know why Dave says he wants to fly from the Big Island to Oahu - I assume you'd want to start by trying it from Molokai first. That's 40 miles or so I think. But definitely you'd want a nice easterly tailwind to push you along. And you'd want a nice chase boat or two. How long does the gas normally last on a paramotor? Molokai is like 22 miles point to point. If we could burn for 2 hrs. it would be easy, barring bad gas. I think that guy invented a maneuver that should be called the " Ferris Wheel".